Alpha testing of my card based pub carpark skirmish game with new improved GIF action! 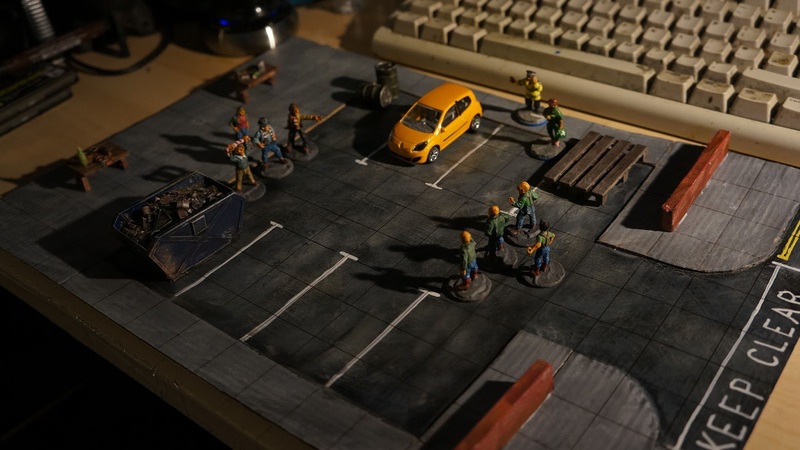 Hooligans from Ainsty, scratch built carpark. 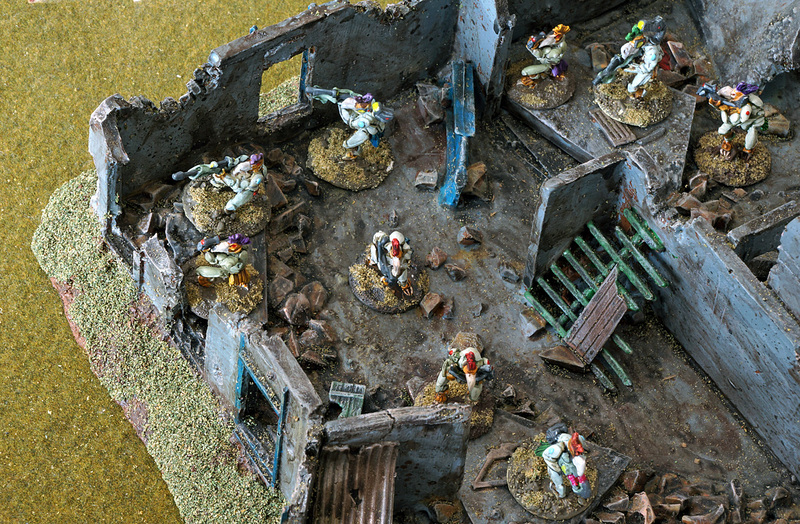 Each player has 4 figures and a pack of 64 cards of appalling actions. Offensive actions include Taunting (swearing) and Argey-Bargey (pushing and shoving) with the nuclear option of Tooling Up. You lose cards to damage (and insults) and the player who loses all cards first loses the battle and is routed from the carpark. Drunkenness is a factor as is expert coordination of your team as your the number of cards you draw each turn is based on proximity of the supporting figures to the main protagonist. Certain actions cause the police to appear who will act on aggressive acts, moved by the other player, until the police officer comes into contact with a troublemaker who then gets whisked off down to the station for an appointment with a set of stairs. More mindless violence to come, probably. After a lengthy period of inactivity, here comes a bit of Saga. 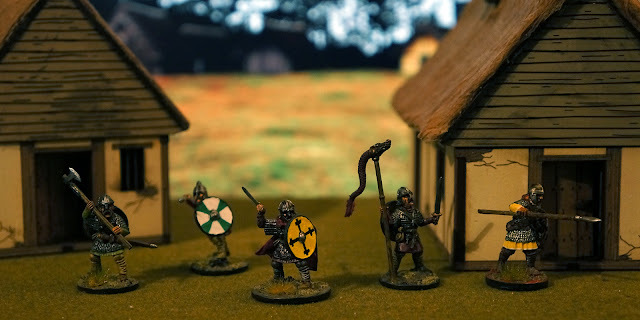 Anglo Saxons finished and pitted against a ruthless invading force of Vikings. 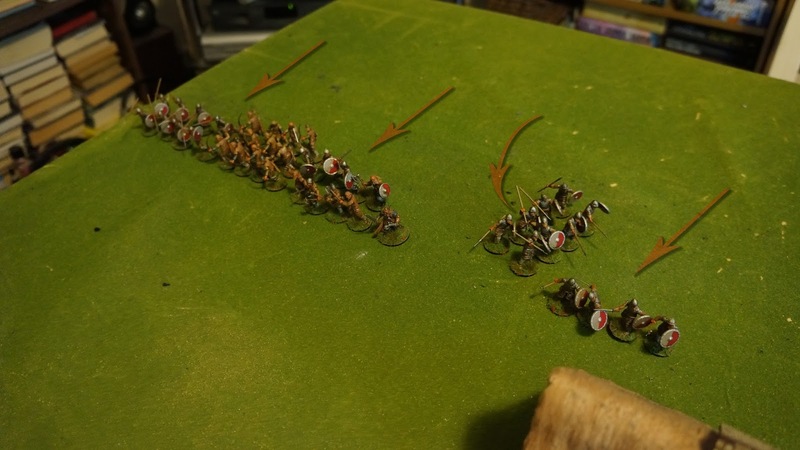 The full army consists of four groups of 12 Ceorls (Levy) armed with spear and shield (warrior-lite), two groups of 8 Thegns (Warriors), one group of 4 Ealdormen (Hearthguard) on foot and one group mounted, and the Warlord, who can also be mounted if feeling suicidal. I need to get some bow armed Levy to add a bit more variation, maybe more warriors too. For this 6 point battle, I picked the mounted Ealdomen, two units of Thegns (one as a 12 man unit and the other as a 4 man unit to hang about with the warlord), and three units of Ceorls. Facing them the Viking army consisting of three 4 man Hirdman (one of which were berserkers), two 8 men Bondi and one group of bow armed Thralls. The terrain was quite bare, one hill that ended up on my left rear, and one large building centrally located. I set up across the table edge, well spaced out, cavalry on the right (away from the Viking bows). The Vikings advance, 1 unit of Bondi turning to hold off a flanking movement by the Anglo Saxons. The Anglo Saxons counter, sending the cavalry right round the flank (taking a fatigue) and charging into to building (also gaining a fatigue). The Viking beserkers and their warlord attack the Anglo Saxon warrior unit causing many casualties, using the power of Thor to force an extended melee. The remaining Anglo Saxon warriors take a break to recover fatigue. The Viking warlord and remaining beserker charge back in, killing all but 2 warriors for the cost of the last beserker. 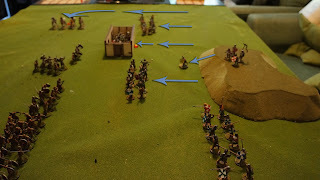 The remaining Saxon warriors fall back and take no further part in the battle. Anglo Saxon ceorls advance on the left flank towards a bondi unit. The smaller, 4 man warrior unit move forward to shield the Anglo Saxon warlord. The other Viking Hirdmen unit advances to support their warlord. The Viking Thrall archers move up and kill most of the small warrior unit. 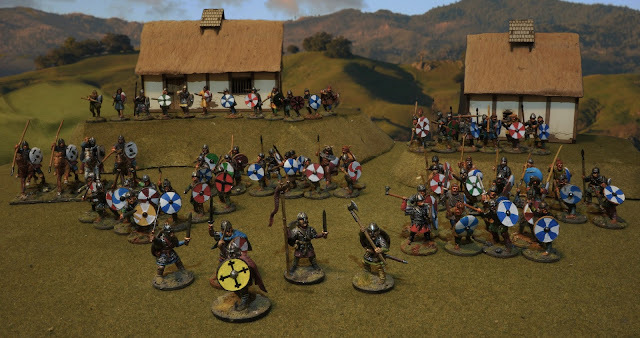 Anglo Saxons go on the offensive with some helmet/horsey action and get the Saxon Kingdom ability going - All the levies now count as warriors for the rest of the turn. The force in the building charge out and do some damage to the Hirdmen outside before being repelled back, then the unit on the right side of the building charge in finishing the job. On the left flank, the Ceorls charge into the Bondi and push them back. Round about here the fog of war and poor memory take toil and a gap in the photostream doesn't help either! In summary the Vikings do some more damage with their archers before falling back while the Saxons advance on the left flank. The cavalry charge in on the Bondi holding the flank and get exterminated, but defeat most of them but fail to get through to the archers. Hirdmen try to take the building. Vikings retreat towards their boats. The casualties on the Saxon side were appalling - we lost more than the Vikings, however we started with more and they lost more expensive troops. It was a close battle and could have swung either way near the end, but watching the dead Saxons pile up off table at twice the rate of the Viking casualties it looked like ending up with a loss right up to the end, however looking back the victory points were closer to parity if not slightly in my favour. There you go! 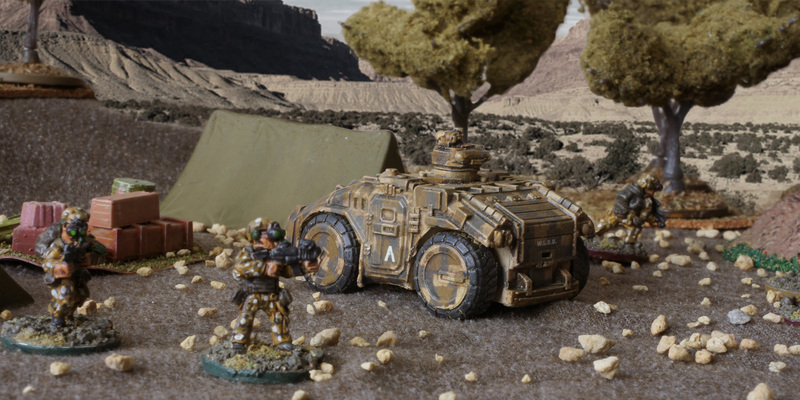 A tabletop battle finally after a long pause, and an army finally painted after lurking shamefully on my bookshelf in undercoats for many months. The blog award is a self propelled chain letter kind of deal, focussing on blogs with less than 200 followers, which unfortunately excludes a bunch of blogs that I regularly frequent. Copy and paste the award to your blog, linking it to the blog who nominated you. Pass the award to your top five blogs with less than 200 followers by leaving a comment on one of their blog posts to notify them that they have won the award and list them on your own blog. There is no obligation to pass this onto anyone but it is nice if you do. 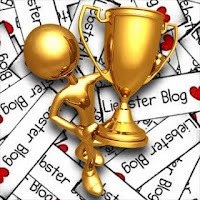 Now a bit of internet searching on the origin of this award gives me the following..."The Liebster Blog Award is indeed what I've originally thought except for some one minor difference. Once you accept your award you have to nominate 3-5 favorite bloggers who have less than 3,000 readers." In a spectacular bit of feedback loopage, my first nomination goes right back to the chap who nominated me. Kobold's Waystar High Port is a Traveller blog, the SciFi roleplaying game with its origins back in the 1970's. Notable highlights include the Traveller A to Z series and the current ongoing Aloin's Saga, a series following the career of an apprentice merchant spaceman. 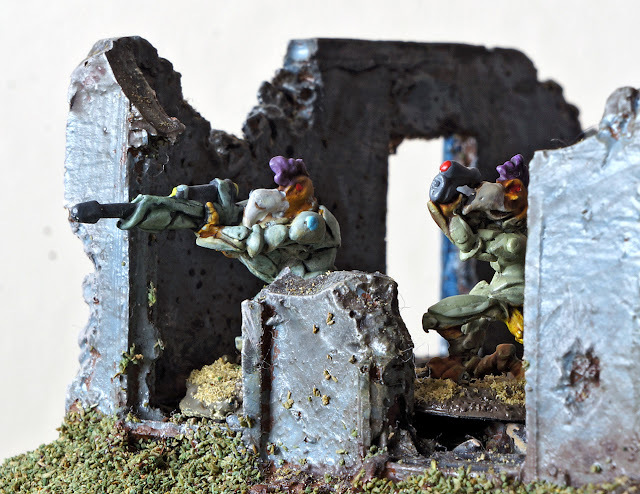 This nomination for Mr Harold's 15mm SF blog is also a little bit of feedback loopage, being one of Kobolds other nominations (who would have thought, people who liked my blog also like blogs I like, wierd huh?). Particular favourite posts include the Shadowrun terrain and vehicles which are very nice pieces of painting and construction, as well as excellently photographed. This one breaks the rules, as Tamsin has close to 300 followers at last count (but this would have been OK under the original rules so consider the rules broken). I started my blog at the same time as Tamsin's and she was one of the first followers of my blog (and sub-blogs) and vice versa. Reading her accounts of the Dark Ages Saga games inspired me to dig out my old Gripping Beast miniatures and get them painted (well assembled and primered for most off them so far). Of all the blog writers I read, she is one of the most prolific both in posting and painting. Also breaking the rules slightly, I found Dux's blog by searching for Saga Roman rules. He has produced a variant for the late Roman period for the 4th and 5th centuries. Lots of good posts and photos. Allison M's blog gets us back on track for the less than 200 followers rule. Some very nice painting, particularly the nazi zombies from the Norwegian zombie movie Dead Snow (easily my favourite Norwegian nazi zombie movie of all time). 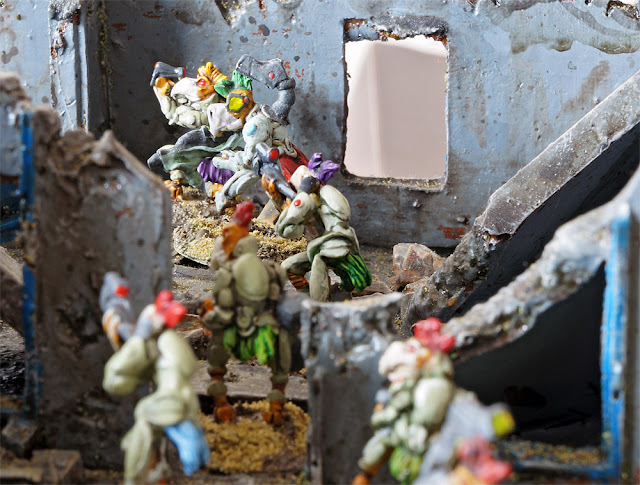 Has to be the best named blog ever for miniatures. Breaks the rules at 316 followers, but so full of excellent painting and sculpting that it has to be included also. Ah that's 6 nominations also, of which 3 break the rules on number of followers. So 3 of them are official nominations and 3 of them are for the newly devised Felonmarmer's Awards for blogs I like (the other 3 also) which has no rules whatsoever. 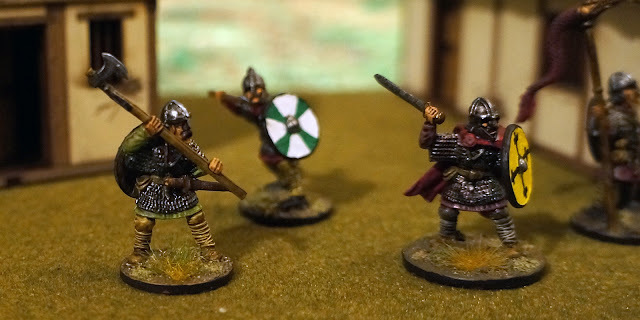 As bit of a departure from the usual, here's a couple of photos of some Gripping Beast plastic Anglo Saxons, that I'm painting for a Saga army. Background houses are 4Ground laser cut MDF jobs - still got a faint whiff of burnt wood about them that a real one with wood fires would have! Less of the other smells associated with the time period though thankfully. Only loads more to do! Khurasan's Polecat Light Armoured Vehicle painted in desert digital camouflage. Here used to support a team of Khurasan's DEVGRU SEAL's at their camp in the burning sands of Erytipium III. This time I painted them all by hand without using masking tape. 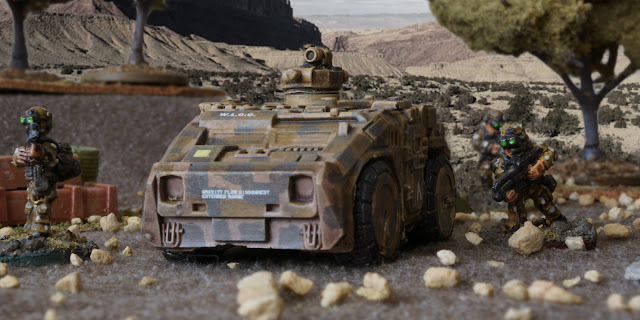 With the high level of detail on the Polecat, masking tape becomes more of a hindrance. Lettering from my 1:48 Chinook spare transfers and an upside down Letraset V. Background image from Arizona I believe. Close up ground from a brown T-shirt. Lighting courtesy of the big yellowy object in the sky shining through my kitchen window, diffused somewhat by an overcast sky - probably the best ambient light source you can make use of, so long as you use a tripod. 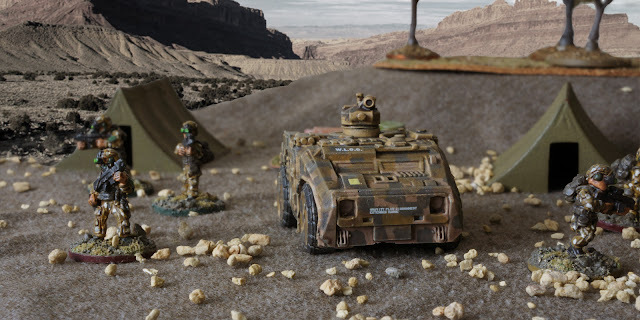 Khurasan's Polecat Light Armoured Vehicle painted in urban digital camouflage. 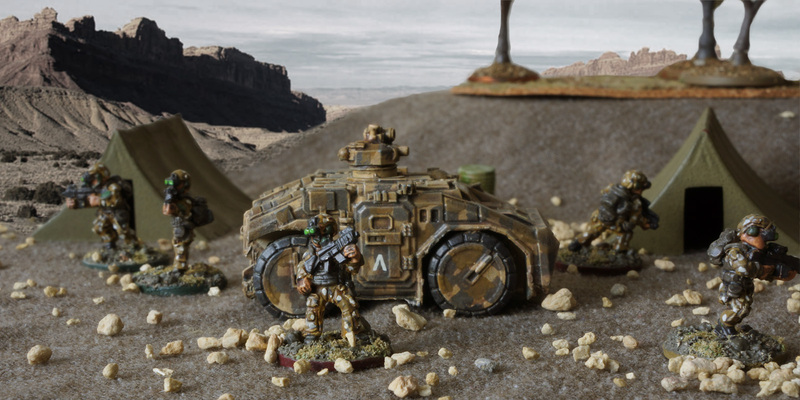 Accompanied by a section of Khurasan's DEVGRU SEAL's as they patrol a ruined section of the city on the hunt for a suspected alien creature. Front View : "Maybe it doesn't show up in infrared at all." Left Side : "You're reading it wrong, that's in the polecat"
Right Side : "We should take off and nuke the site from orbit"
Rear View : "This city is headed for a disaster of biblical proportions." 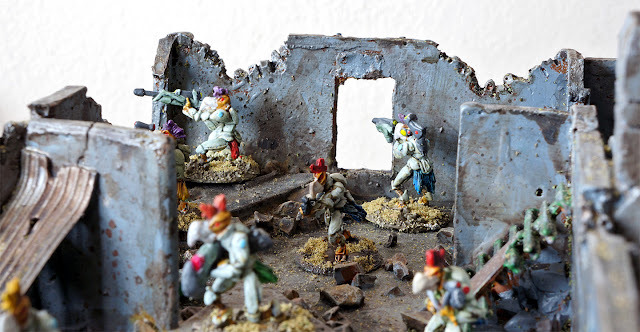 Spray gray with Army Painter base coat, then apply small rectangles of masking tape, stipple paint with darker gray (following Mr Harolds guide on his blog). Thought about putting on a more rectangles to do a darker coat, but on realising it'll end up jet black, went for a 2 tone pattern instead. Peeled of most of the rectangles and then realised as the Polecat was highly detailed the edges of the squares were not very distinct as the paint got under the masking tape due to the raised detail. Ended up tidying the squares up by hand and then painted in a lighter set of squares by hand anyway. Symbols and text from some letraset and some spare water slide transfers from a helicopter model. 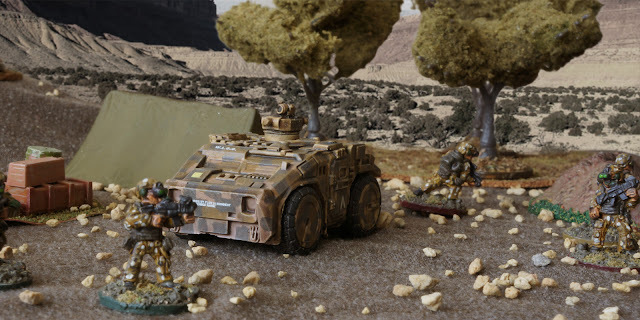 Background image from scenicreflections, foreground ruins from me, asphalt road surface by Metcalfe Models. Giant alien bug hiding in the ruins from Khurasan.